"We're helping them change their lives." It’s a sleepy June morning on the Westside of Atlanta. But on this day, a dozen students are up, some before the sun, ready to start a new chapter of their lives. Today is the first day of Construction Ready. 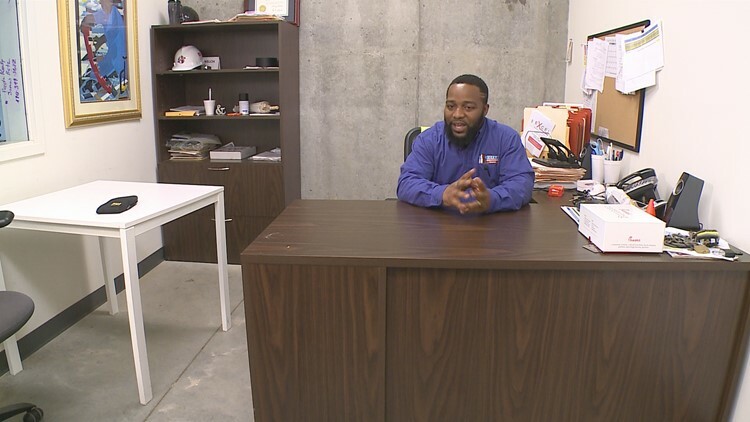 For several years, the Construction Education Foundation of Georgia has offered the free, 20-day program that places unemployed Atlantans with no prior experience into entry-level construction jobs. Atlanta consistently places among America’s worst cities for income inequality. A Brookings Institute study earlier this year ranked big cities by household income inequality levels, and Atlanta showed the highest. Households in the top 5% make 18 times as much as those in the bottom 20%. According to the statistics, if you are born into poverty in Atlanta, you will likely remain there throughout your life. This program - and its students - seek to change that. These twelve candidates are ready to start a new chapter of their lives. The students file into a classroom. On the first day of class, Anthony Welch, the site manager of training and placement for the CEFGA, explains the structure of the course. Construction Ready is a classroom program that helps students gain eight industry credentials needed to get job placement at a construction site – which usually take six to eight months to acquire – in just 20 days. It is free and costs nothing to participants. But, like everything, it comes with certain caveats. “You’re not guaranteed a job. We’ll get you credentials. We’ll get you training and try to get you back to work. It’s up to yourselves to promote yourselves,” Welch lays out. He explains that everything will be structured – boot-camp style. From learning how to use hand tools, to working with a great attitude, instructors promise they will help them through the program. But there will be tough love. And no excuses. “I have missed five days of work since 1969. I have been late three days. Do I have any sympathy,” asks Raymond, one of the program’s instructors. The class replies with a no. “If you can’t get your life together, there’s the door,” Raymond warns. The class silently nods with acceptance. There are also strict rules to follow in the program. Cell phones must be off and must remain in a locker. The only time they can be used is during lunch or outside the classroom. Walking of a job will lose you 31 points. No fighting. If you’re caught, you’ll lose 31 points. And be fired. But the rules, are for a purpose. “You’re here now because whatever you was doing before wasn’t working, and now you’re needing that help. So we’re gonna be the person to give you that help,” Welch assures. Since its inception in 2014, Welch says there have been nearly 600 people who’ve gone through the program, working in Atlanta today. And while not everybody will make it through the program, Welch says the payoff – seeing program graduates get placed with construction jobs, buying homes, new cars – makes it all worth it. “We’re helping them change their lives,” he concludes.